Alves, F., Towers, J.R., Baird, R.W., Bearzi, G., Bonizzoni, S., Ferreira, R., Halicka, Z., Alessandrini, A., Kopelman, A.H., Yzoard, C., Rasmussen, M.H., Bertulli, C.G., Jourdain, E., Gullan, A., Rocha, D., Hupman, K., Mrusczok, M.-T., Samarra, F. I. P., Magalhaes, S., Weir, C.R., Ford, J.K.B. and Dinis, A. (2017). The incidence of bent dorsal fins in free-ranging cetaceans. Journal of Anatomy, DOI: 10.1111/joa.12729. 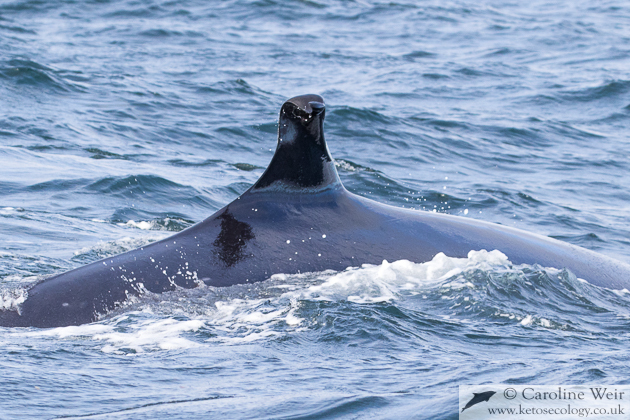 More information is available at the Journal of Anatomy website..
Laterally bent dorsal fins are rarely observed in free-ranging populations of cetaceans, contrary to captivity, where most killer whale Orcinus orca adult males have laterally collapsed fins. This topic has been poorly explored, and data/information on its occurrence and possible causes are limited. The present study: (i) undertakes a review of the available information on bent dorsal fins in free-ranging cetaceans, and updates it with new records, (ii) reports on the proportion of bent fins in different study populations, and (iii) discusses possible causes. An empirical approach based on bibliographic research and compilation of 52 new records collected worldwide resulted in a total of 17 species of cetaceans displaying bent dorsal fins. The species with the highest number of records (64%) and from most locations was O. orca. On average, individuals with bent dorsal fins represent < 1% of their populations, with the exception of false killer whales Pseudorca crassidens and O. orca. While line injuries associated with fisheries interactions may be the main cause for P. crassidens, and the vulnerability to health issues caused by the evolutionary enlargement of the fin may be the cause for O. orca adult males, factors contributing to this abnormality for other species are still unclear. The occurrence of bent dorsals could be influenced by a set of variables rather than by a single factor but, irrespective of the cause, it is suggested that it does not directly affect the animals’ survivorship. While still rare in nature, this incident is more common (at least 101 known cases) and widespread (geographically and in species diversity) than hypothesized, and is not confined only to animals in captive environments. Investigation into the occurrence of bent fins may be an interesting avenue of research.